I needed to go into Home Depot for some random purchases and as I walk through a store with such a magnitude of distractions, I find it extra special to be impressed with eye-catching graphics on packaging. There is so much orange and different large shapes and household appliances on display! There is the smell of fresh lumber and the chill of the concrete floor and the eery blue of the warehouse fluorescent lighting. It would be awfully challenging to break through the noise. 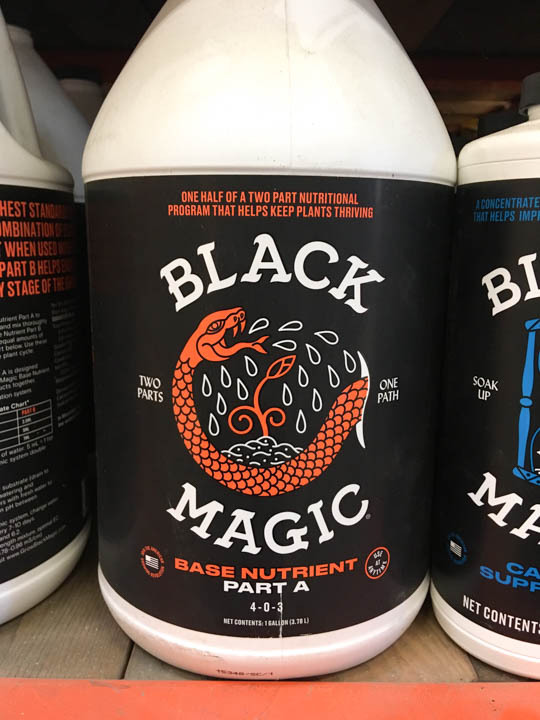 Today I would like to discuss the shelf appeal of Black Magic Gardening Products. First, Black Magic branding is whimsical and fun. The occult of gardening expresses that plants are these magical organisms and you (the magician or witch) have the power to control these living beings. It puts a fun spin on the daunting prospects of learning how to garden. The brand sends a clear message: gardening = fun. Second, Black Magic is targeting indoor urban growers. This is not meant for larger farms or plots of land. The brand appears to be a more beginner level grower. This is good to target a specific group with a educational tone. Third, the idea that fertilizer is the secret ingredient in growing success is a great appeal for those who love their plants. It brings in a scientific and nutrient-based approach to indoor gardening. 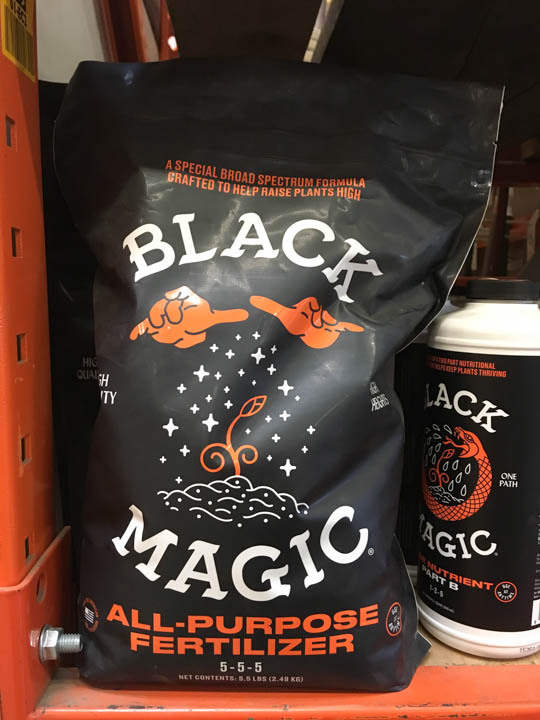 Although the full catalog of products was not present at Home Depot, it is clear from the growing options on Black Magic’s shop page that they have a nerdy take on growing. It seems a lot of conversation around indoor gardening has to do with light and water but Black Magic suggests that your plants have several needs. I am sold on Black Magic! I would buy this product. Not only does it look good on the shelf at Home Depot, it would look good in my utility closet next all my plant supplies.